Each county in England has suffered the loss of at least some of its wealth of country houses. Although nearly 1,800 have been identified so far, it’s clear that some counties, such as Somerset, escaped relatively lightly whilst others such as Yorkshire were severely depleted. Of course, the losses are not simply about numbers as these can mask the importance of the individual houses. One county which has been deprived of not only a significant number but also some houses of national importance is Suffolk in East Anglia. Financed by early wealth from the wool trade followed by large scale agriculture, Suffolk boasts some of the finest houses in the country including Somerleyton Hall (built for rail magnate Samuel Morton Peto), Ickworth (the spectacular home of the Marquesses of Bristol), and superb Elizabethan Long Melford Hall. Yet Suffolk has also lost nearly 60 other country houses of all ages and styles to both fashion, finance and fire. 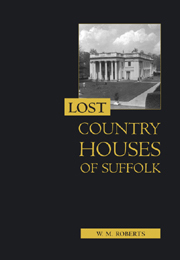 A new book focussing on these losses called ‘Lost Country Houses of Suffolk‘ (Boydell & Brewer, 2010) has just been published by a Suffolk author W.M. Roberts. This superbly produced and researched book highlights 40 of these now vanished houses, including the larger houses such as the beautiful Rushbrooke Hall, and the lavish Flixton Hall, but also the smaller ones such as Assington Hall, and provides detailed histories of the ascendancy of the houses before explaining their demise. Lavishly illustrated, the book is also a wealth of detail with further details and sources for anyone, be they genealogist or local historian, looking to research even deeper. The book is available direct from the publisher or via Amazon or all good bookshops. Full disclosure: I contributed a little of my research into England’s lost country houses to this book but I make no gain from sales. This entry was posted in Comment, News and tagged architecture, books, development, heritage, listed, lost country houses of suffolk, suffolk. Bookmark the permalink. I tried to purchase this book from Amazon once I knew from the publisher that it had been issued – but Amazon seem to be having problems sourcing it. I await with bated breath!